As part of Alaska Public Media’s observance of Veterans Day, we’re taking a look at how Alaska became involved in World War 2, and how those events attracted the attention of the continental United States and the rest of the world. We will hear three separate stories, the first of which comes from a navy pilot who flew in the Battle of Midway. 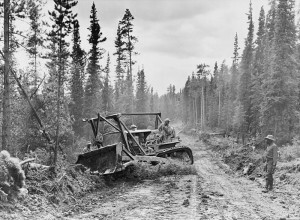 We’ll then learn about the hard work and sacrifices made by the black soldiers that helped build the Alaskan Highway. We’ll finish the program learning about the Lend Lease program that sent American planes to Russia. Z.W. “Ski” Kowalewski, a former Navy Pilot who flew in the Battle of Midway. Ski has published a memoir of his WWII experiences entitled, A Sailor’s Life in World War II. RECORDED: Friday, October 12, 2017 at Eagle River High School.